An hour after I leave Shiraz, I arrive on the Persepolis site. It is late in the day, so I just camp for a small fee on the parking lot, in front of the police station. It is quite windy, and I have to use ropes to secure the tent fabric tight so I don’t have the flapping noise all night long. In the morning I fold the tent and walk to the site. 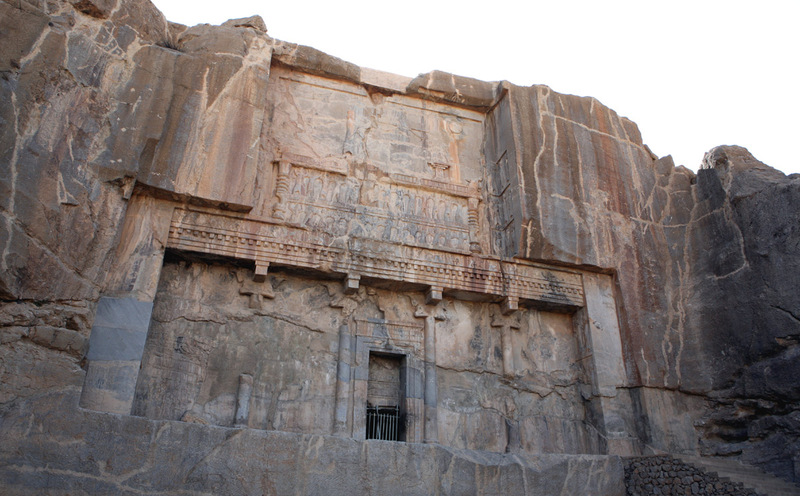 It is early when I penetrate the gates of Persepolis, and there are not much people. The impressive site under the early – and already hot - sun. 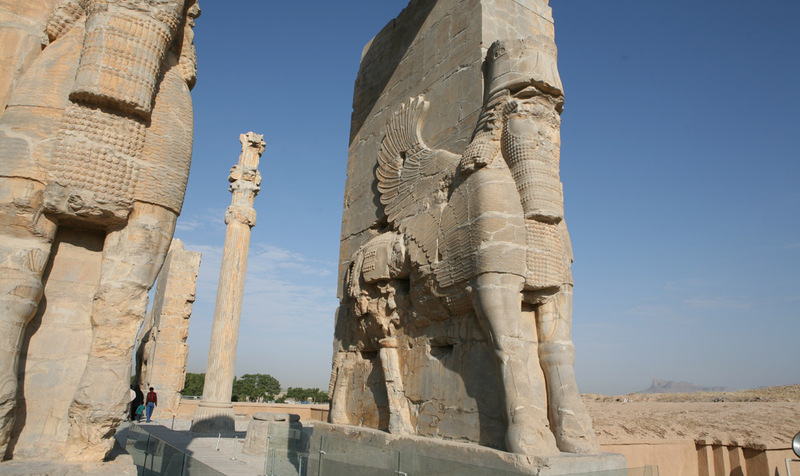 Persepolis is the symbol of the Achemenid Empire which started in the 7th century BC. It is the most famous masterpiece of the Near Eastern civilizations. The ancient city was lost for hundreds of years, covered by sand, and only in the 30’s excavations have started. 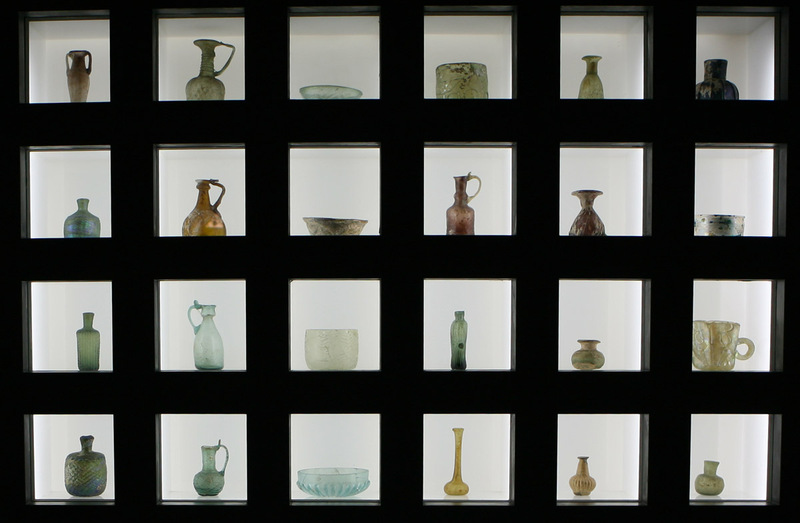 As usual in Iran, the site and its museum are very cheap to visit, at US$ 0.50. In fact what is expensive in Iran is the lodging; otherwise it is the perfect destination for the budget traveler. Artaxerxes II tomb on the hill dominating the site. I spend a little bit more than two hours strolling through the site and go back to the truck for the long drive to Esfahan. Esfahan, one of the most beautiful cities in the Eastern world, is the country third largest populated place. 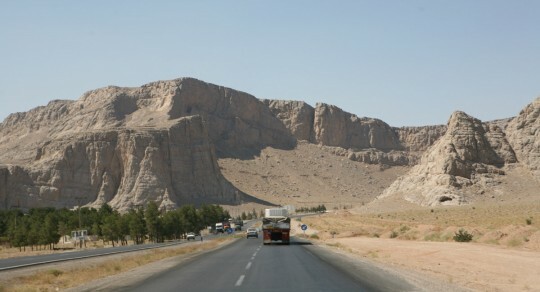 It is more complicated to navigate than Shiraz where I went everywhere by foot. In fact, I decide to spend two nights there, in another touristic complex (US$10) with a vague soviet feel. I leave the car at the campsite and explore the city by bus. Transportation is cheap here also, and you never pay more than few cents to take the bus or, in Tehran, the subway. 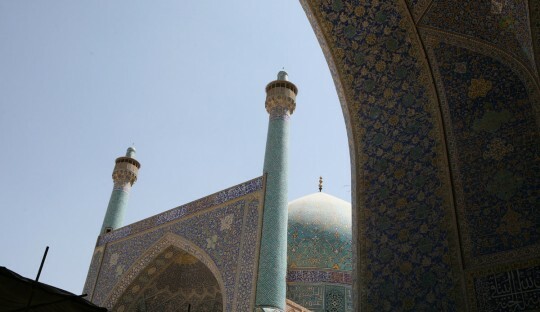 Entering Hakim Mosque in the Esfahan city center. I first visit the Hakim Mosque, the oldest in the city, as I follow the Lonely Planet walking tour, one of my favorite features in the guide. Ablution room. Also nice to cool down a bit after walking in the city. 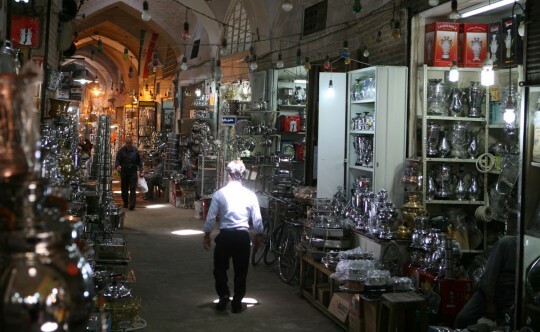 Then I enter the Bazar-e Bozorg where vendors sell carpet, household items, spice, jewelry and fake brand-name clothing. 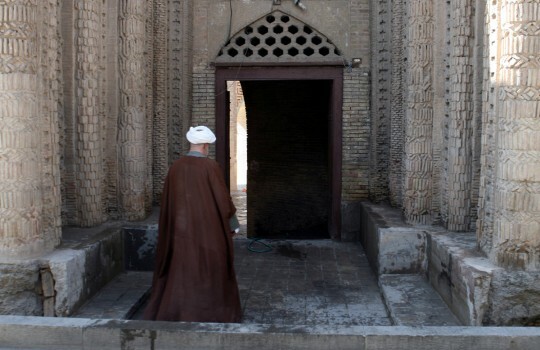 It is a thousand-year old labyrinth with mosques, banks, gardens and many alleys. 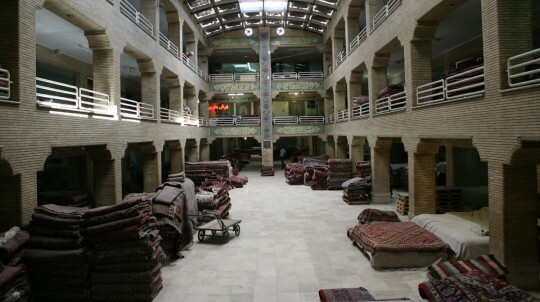 The Bazar-e Bozorg in Esfahan. One of them leads me to the Jameh Mosque dating from the 11th century. The central ablution fountain in the courtyard was designed to imitate the Kaaba in Mecca. 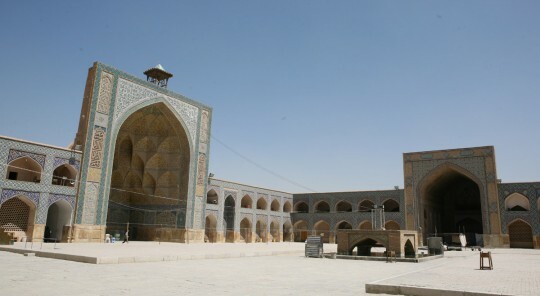 The Jameh Mosque at the center of the bazaar. I continue to walk through the alleys. 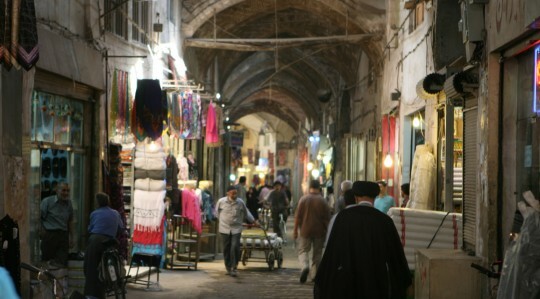 Such covered markets are great as you are protected from the heat of the day by the arcades. 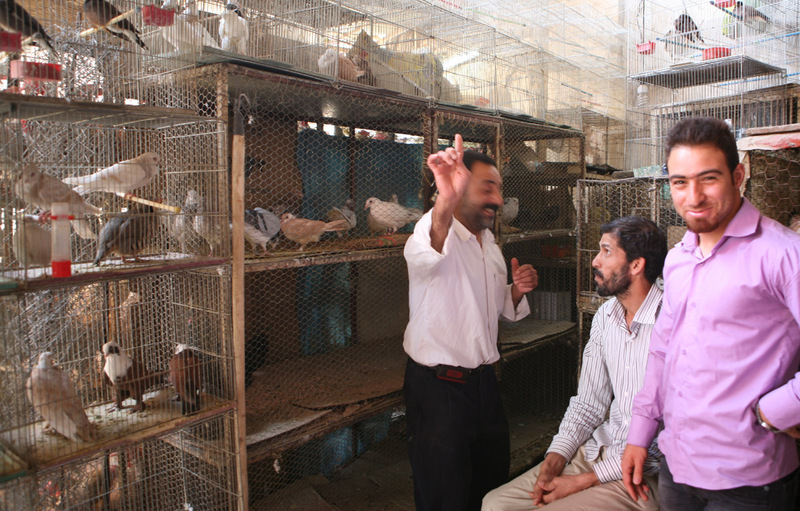 Around noon I venture out for a quick visit to the bird market where friendly vendors show me some species and we compare the names of the bird in Farsi and English languages. I also visit the Mausoleum of Harun Vilayet which features impressive mosaics of Khomeini and Khamenei. Mausoleum of Harun Vilayet, an important pilgrimage site. Back in the bazaar, I try to find a place to eat. Most of the eating options in Iran are kababs. Those are served with rice, bread and tomatoes. Cooked over charcoal, this food is relatively healthy. Everybody here drink “dugh” which is sour milk and yogurt mixed with water. It is very refreshing and kind of similar with the drinking yogurt you can find in the U.S., without sugar. 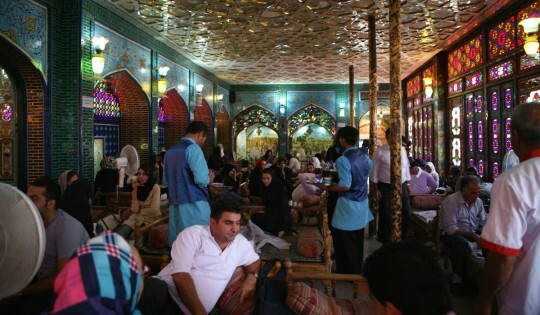 I stop for lunch in a traditional restaurant close to the Imam Square, where parties sit on day bed and can try Iran specialties. Afterward I go visit the Imam Mosque and its two turquoise minarets, another fine example of the astonishing mosques you find in Iran. 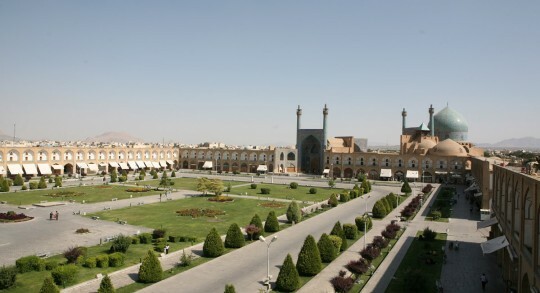 It is also on Imam Square, the second largest square in the world. By then I begin to be tired but find the energy to visit the Al Qapu Palace from which I can get a good view of the square. Before going back to the campsite after this heavy day of walking, I go get a glimpse at the Si-o-Seh bridge crossing the Zayandeh River. There’s a teahouse at the end of the bridge where people relax and hide from the sun. 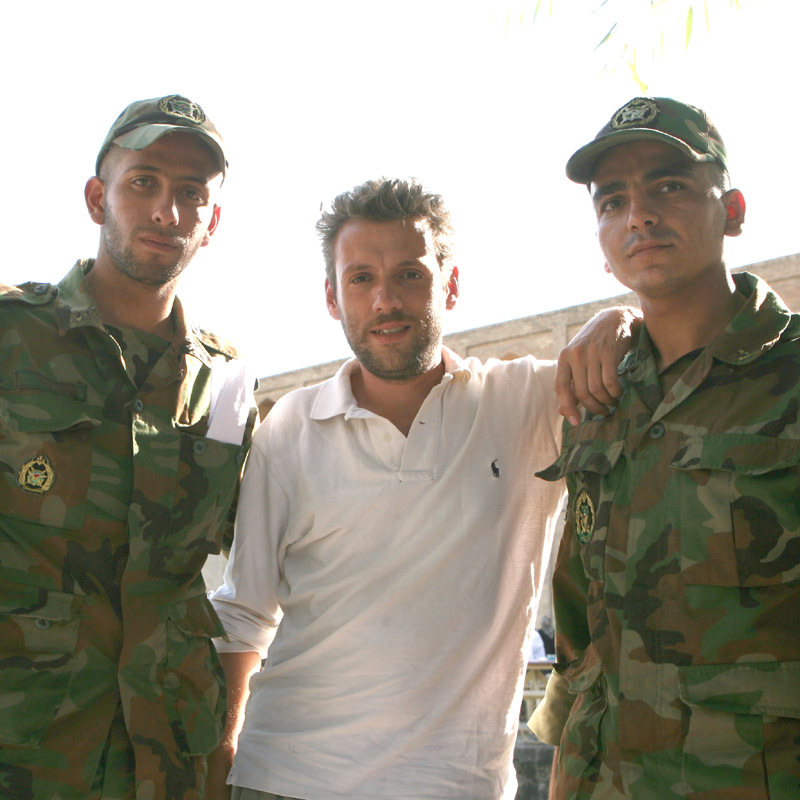 Making friends in the Iranian military. I go back “home” to take some well deserved rest. I continue to watch the “long way round” television series, and get more excited about crossing Siberia. I decide that I will go straight to the Russian Embassy when I arrive in Tehran and see if it is possible to get a visa quickly. After one more day of driving, I enter the crazy traffic of Tehran. At nightfall, I accept that it is no place to camp, and find the Khayyam hotel, a bit too expensive to my taste (US$18), but with a parking lot, which is rare in the city. It will be my base for few days as I will be working on paperwork and visiting the city. The Ramadan begins the following day, and it will be more convenient to be at the hotel, since you can’t drink, eat or smoke in the street during the day. I think the most difficult is to not be able to drink water, especially when you have to run everywhere under a fierce sun to get things done. Mural on the wall of the old American embassy. It is an impossible city to navigate and a challenge to find places. The first day I go to the Russian Embassy to find it close. I spend hours trying to locate the Kazakhstan Embassy and decide to go the following day. I get some work done on my car as the hotel is located in an area where I can find a lot of things usually difficult to get. I lubricate my chassis in the hope it will eradicate a thumping noise I get each time I stop the car. Check and top transfer case oil and change sparking plugs. The following day I am back on the visas quest. The Russians have bad news for me. It would take more than two weeks to get the visa. Plus one week for Kazakhstan and five days for Turkmenistan. My Iranian visa is not long enough, and anyway I need to keep moving. 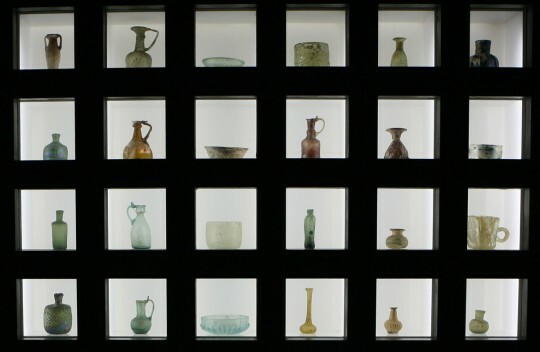 The glass and ceramics museum in Tehran. I have to find another way. Finally at the end of the afternoon, I find out there may be a container boat leaving Bandar Abbas for Mumbai, India at the end of next week. I have to check back with Maersk, the maritime company on Sunday. 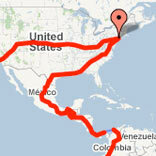 That would means I would backtrack 1,000 miles (1,600 km) to the port I arrived at, and stuff the truck in a container. If there is no cabin available in the boat – which is likely – I will take the ferry back to Dubai and fly to Mumbai. The cost of shipping – all included – should be around US$800. The ferry will cost me another $100 and the flight $150. Sailing time for the container boat is four days. Now I am kind of sad to not cross Siberia. But this is the deal. I have to keep moving east. according to Wikipedia its the 16th largest square…but who knows how they all measure it. bummer about pakistan — but I prefer to see you go south than North anyway. Siberia would’ve been a lot of nothing I’m guessing…but what do I know. wow! Amazing pics, Nick! I have to say, this was one leg of your adventure I was really looking forward to. It’s not often that we get to have a glimpse of life inside of Iran. It really is a beautiful country with enough architecture and history to keep anyone busy for longer than any visa you could probably get. Too bad about Russia – I hope you have a safe trip back to the coast and onward then to India! Wow, those Mosques are so incredibly beautiful! Such a bummer about Russia, but I’m really excited to see your pictures from India. I have a friend who’s from Mumbai, so I can’t wait to hear your take on it! It is better avoid Pakistan. Come and welcome to India. You should not miss Kerela if you are traveling in India. If you need any assistance write to me. I am from there. I think is was one of your best posts so far. The pictures look amazing!! How were the people in Iran? Were they friendly? Were there many tourists there? Best of luck with the truck & shipping it to India. Can’t wait for the next post. This was an awesome post, one that I’ve been looking forward to also. It’s a bummer you will have to ship your truck again. No luck camping at the Russian embassy I take it? Have you given any thought to shipping to and driving through Austrailia for your last leg since you are going to miss a few places? Hey Nick~! I don’t know where I was in history class in high school, I have never have seen such beauty in Tehran. (Well, maybe it wasn’t in our history books then). LOL You continue to show me parts of the world that I couldn’t have imaged, except for what I see in the news. Seeing the world in your eyes continues to be a great adventure for me. Really glad that you are able to get some siteseeing in now instead of the dust and dirt. Sure hate that you have to back track again, but there is a reason for everything! Your not meant to go into more dangerous territory than what you are already doing. Looking forward to India and the rest of your journey!! I’m sure you are the minority everywhere you go. Do people stare and ask you questions? Do you find very many people that speak english? Geez I would be completely lost again trying to communicate. The tile work on those mosques and mausoleums is astonishingly beautiful! How fortunate you are to be able to see them in person and thank you for sharing with us. This is the mother in me stating the obvious, but after your Djibouti experience I’m sure you will confirm your space on the container boat before backtracking 1,000 miles. Best of luck and travel safe! Great post! Fabulous pictures! It’s beautiful there. Traveling through the heart of Muslim country, do you stand out or are there many tourists there. The mural on the Embassy wall speaks volumes about the sediment towards the US. Do you see a lot of anti-American sediment as you travel? What do you do when the people are called to prayer, and if so inclined, are you allowed to pray with the men? I love love love the pictures. Absolutely fascinating. I too wondered where the people are? Maybe with the heat they come out more after dark. I have so many questions for you! Mostly about the language barrier and if it’s difficult getting help from locals. You must feel that every step you take includes SO many of us that are with you in thought, prayer, and spirit! thank you again for such wonderful information and beautiful pictures. Please stay safe and continue to enjoy all that you see and do. This is Carey from the Spokane, Wash. AP office. I was happy to read that you’re watching “Long Way Round”. I was wondering if you were going to have time to watch it before you left NYC. Hopefully you’ve enjoyed it and have gotten a few tips from them. The episode documenting the “roads” in Mongolia is the best of the series. Sounds like you are enjoying Iran. It was a concern, you traveling there. The mosques are beautiful, Your pictures are beautiful! I never thought of Iran having any beauty whatsoever. Your journey has given me a whole new prespective. I am loving it. I also rented “Long way around” and “Long way down” . Am always looking for your next post. Safe travels and God bless. I’ve followed and read almost all your postings since leaving the U.S. but not one to typically write on a public site. I have to say that your current trip to Iran is by far the most ‘eye-openning’ since it’s a country that we don’t see much of except when there’s a news event. 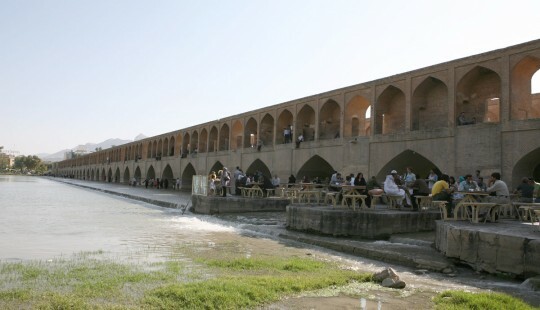 I did once watch a show on Rick Steve’s travel when he and crew ventured into Iran and found the folks there so friendly and accepting of foreign tourists. Iran has so much history – almost the cradle of civilization and so much to learn from. Such awesome photos. They portray, at least for me, all that is fascinating about that part of the world. 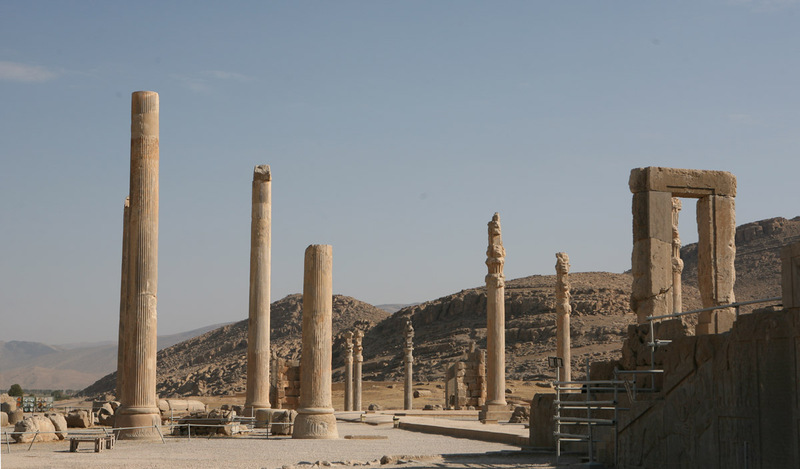 There is soooo much ancient history in the Middle East. I am a bit of a history buff so that is why I find these photos particularly enjoyable. Cannot wait for you to get into the rest of Asia – particularly India. The photos you take there will be equally fascinating (just as all your others have been). As always, travel safe and godspeed. I hope my last donation found you well. I think it is a good choice to ship from Bandar Abbas to Mumbai. Even without the visa issues I think it would still be a bit of a problem passing the Caspian Sea area thru the lower ___stan country’s. You should have smooth sailing across India and Bangladesh. The next problem I see may be in Myanmar (Burma). Run by the military since 1962 the government is loaded from top to bottom with all kinds of corruption with its sole purpose of taking all it can from its people. Its major export is natural gas. It is also the second largest producer of illicit opium as well as human trafficking that is facilitated by crooked government officials. The United States, the European Union, Canada, and Australia have imposed financial and economic sanctions on the country so obtaining a visa could be a problem. If you are able to get into the country crossing it could be another problem because of infrastructure issues as well as security, sanitation and fresh water concerns. Portage may be your best bet for this part of the trip. Travel should be better once you get to Thailand. While in India you need to think abut which direction you want to go. One option would be east through Cambodia to Vietnam, north up the coast of the South China Sea to China. If you can get into China, visit Hong Kong then to Shanghai and ship from their to San Francisco / Oakland. The other option, and the one I would prefer would be South and East to Singapore, Sumatra, Java, Bali, Sumbawa, Flores, Timor-Leste then on to Australia and ship to the west coast. I think this would be a great trip using ferries between the smaller island countries. And most likely less paperwork issues. Good luck with the next leg of your Quest. I got goosebumps reading your blog! 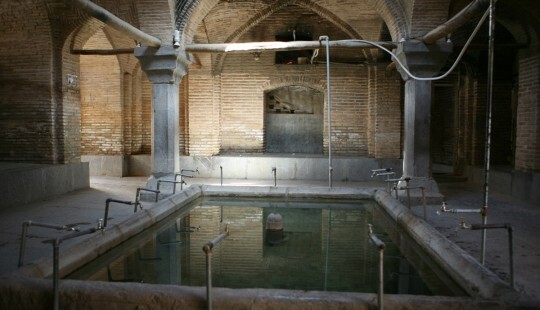 Iran is so beautiful and exotic. How wonderful you get to experience what many of us only dream of. Safe journey. Iran looks like an awesome place. As an American — can’t say I would feel welcome there — but it looks interesting and beautiful. Charles: from what I understand, Vietnam is very restrictive on temporary importation of vehicles (foreign traffic) despite the fact that they allow international driving permits. It will be very difficult to get into Vietnam. I won’t be surprised if Cambodia is the same. China is not signatory to the Geneva road traffic conventions and therefore does not accept international driving permits nor foreign vehicle registrations. High fees will have to be paid to hire a local guide as well as having a special vehicle registration (temporary plates) and a temporary Chinese driving license. The costs are just too high for just a limited time in China. It is just end the journey in Malaysia. Much cheaper. I’m not crying the “the Sky is Falling” and certainly not trying to make lite of the current tensions between Iran and Israel… however, legitimate sources in the US are predicting Israel will bomb Iran August 21st…. one week from today! Stay in touch with the news if you can… Safe travels. You don’t want this to become the Ultimate “Year of living dangerously”!!! “dugh” which is sour milk and yogurt mixed with water sounds like a good treat. yep Maersk unload there ships here in seattle. Hope you get on. 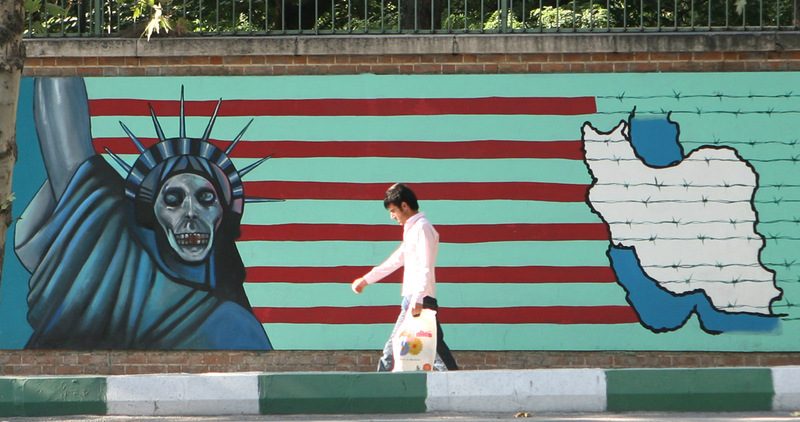 Mural on the wall of the old American embassy. seem like a slap in are face. but hey this country is turn bad quick a way of underworld evil in control right now! I love your laid back attitude toward all the minor/major setbacks. Your spirits seem unshakable. Nice Pictures. The mosques have amazing architecture. Glad to know you are traveling to India. Stay safe.. I saw you wrote that your Iranian visa is not long enough to get all the north route paperwork done. You should easily get your Iranian visa extended. One month at a time up to three months. Ramadan is an interesting time in a Muslim country. We were in Turkey a few years ago during Ramadan. Our tour guide explained the rules of who was to follow the fast – basically, ill, older people and children do not have to follow the fast, along with those who are travelling a long way. I assume you are not Muslim. If so, you are able to eat and drink throughout the day as retailers are allowed to sell to people during the sunlight hours. This is, by far, my favorite post of yours. It truly has brought a delightful perspective of beautiful Iran. Considering all I hear of Iran via the news is negativity, your post was truly refreshing. What a beautiful country! 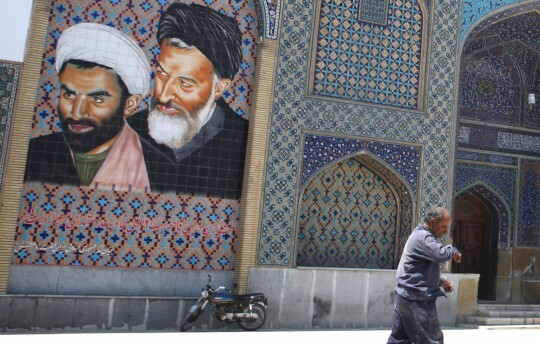 Comments here about Iran’s “beauty” would appear over-stated to me – and I am not talking about the fascination people have with the mosques and the tiling on the buildings – they truly are beautiful. As are the famous persian carpets. But the countryside appears a bit drab, doesn’t it? What about the natural beauty? Perhaps it has a different kind of beauty from what I’m used to – greener beauty. Guess I’ll have to check for myself one day. I am now in Bandar Abbas trying to arrange the shippment of the truck. As usual, the shipping process is kind of a nightmare. 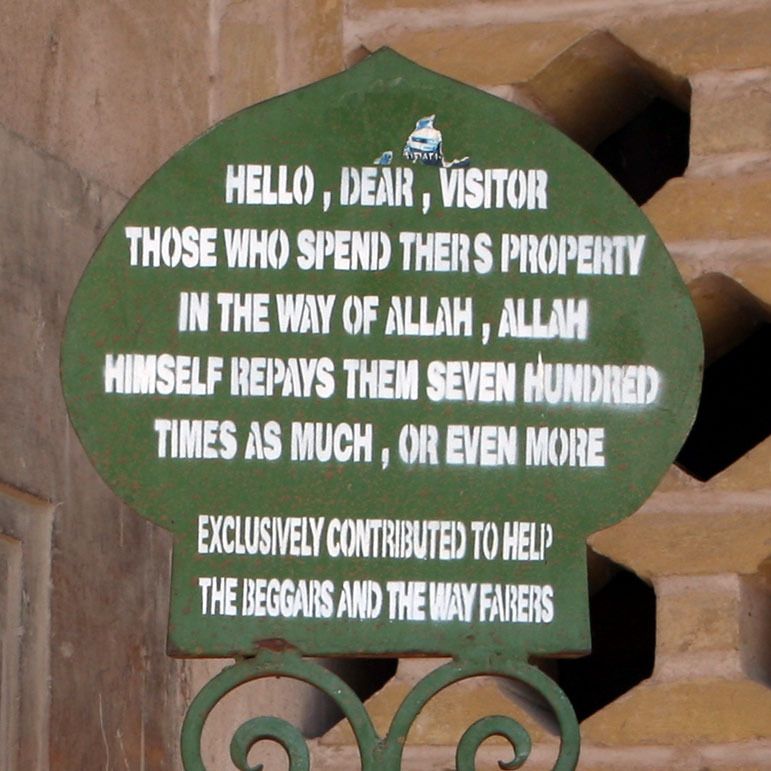 If I am lucky, I will be in India Wednesday… I promise I will update the blog ASAP, just have been very busy. Speak to you guys later! @Edwin: Cambodia forms no problem whatsoever for Nick and the car, Vietnam shouldn’t be either, it just takes a bit more time. 3 years ago we did this stretch, at that time however it was not possible to drive from Cambodia into Vietnam, I don’t know if that situation still exists. The thing is to enter from Laos into Vietnam. To go from Vietnam into Cambodia will be no problem. Ok. Nicolas, wish you all the best.